If you are looking for a compact audio system for small to medium-sized rooms in your home, the Sonos Play: 1 should be on your shortlist. 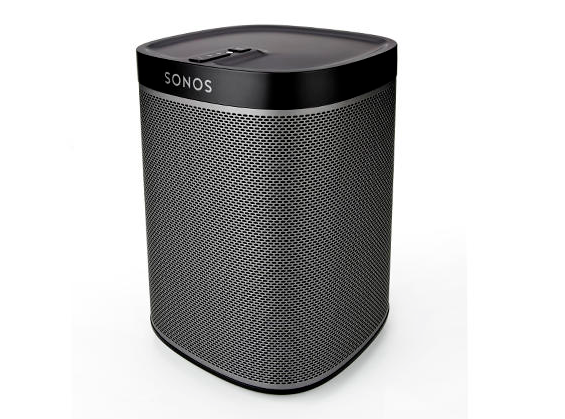 Sonos has been around since 2002 delivering quality, compact speakers. Its real claim to fame is the way it allows you to easily network speakers together into a wireless mesh network that you can control from one central place – which used to be a remote control but which is now your smartphone. Sonos has a fulsome range of speakers, including soundbars and subwoofers for home theatre. But for simply playing music from multiple different streaming sources, the Play 1 is a great option. It has a small footprint, sitting easily on a bedside table or tucked away on a lounge bookshelf. The speaker is 16cm tall and features a wrap-around metal grill. the base and top are made of plastic, but the build quality, like all of the Sonos speakers, is very good. Sonos keeps it very simple – on the top there are volume controls and a play/pause button and that is it. There is an ethernet jack on the rear to connect you to your network if you’d prepare that to using wifi. And there’s a thread for fixing the Sonos to a mount which is sold separately. Crucially, there is no line-in port – so you can’t feed in sources from other devices automatically – for that you’ll need the Connect device, which is sold separately and, for instance, lets you plug your stereo into the Sonos. Powering up the Sonos speaker, you then need to connect it to your wireless network. This is done via the Sonos app which is available on iOS, Android and Amazon devices and software is available for Windows and Mac machines too so you can control the speakers from your computer and stream your offline music library. Then it is a matter of searching via the app for the speaker. I added a second one for the bedroom via the app. The whole set-up process took just a few minutes. The app features access to streaming services from the usual suspects including iHeartRadio, Tidal, SoundCloud, Spotify, Apple music, Deezer, Stitcher and Google Play Music. That covers all the bases I need, though audiobook service Audible doesn’t seem to feature. the iHeartRadio app gives you most of the major New Zealand radio stations, including NewstalkZB and RNZ, so covers many of the remaining bases. Once you’ve connected the speakers to the network via the app, it is just a matter of logging into the streaming music services available via the app, or scanning the music folders on your connected computers to index all the music tracks you have available to play. The app lets you control what is being played and to adjust the volume. I love being able to play a song from Spotify in the lounge and a different song from the same Spotify account in the bedroom. So you can have Sonos devices throughout your home adjusting what rooms you want music played in and at what levels. The ease with which Sonos does that gives it a continued edge in the crowded audio market. Sonos doesn’t use Bluetooth like most wireless speakers do, but its own networking technology based on wifi, which is very good – will no noticeable lag, except, I found, when using the Spotify app directly (instead of the Sonos app which collates the music streaming services in one place. For its size, the Sonos Play: 1 packs some punch on its own. Positioning two around the longe gives a great stereo sound effect for my small apartment lounge – more than I’d ever need. The Sonos features a mid-range/bass driver and a smaller tweeter. The bass in particular is impressive for the footprint of the speaker. At high volume the speakers remain clear and rich in sound. If you add a sound bar, this would make a great home theatre audio system. But that then puts it in a different league of competitors. The Play: 1 will really appeal to those who want to more easily manage music playback through the house, want ease of use and hassle-free set-up. For the price, the Sonos Play: 1 is a compelling option.